…the great hall of many doors. A sound made them all turn suddenly. A small black cat ran out of a door to my right, sniffed at us, and, before I could move, ran out of the hall. It was fortunate that I was still standing with the rest of them or they might have noticed. Faint voices came down one of the corridors. As a method to choose between two equally valid doors? I haven’t seen this mentioned elsewhere, but here’s some additional Poe-related clues. First, given the rather obvious black cat, the use of the word “fortunate” seems to nod in the direction of Fortunato (referenced in Room 39). There are seven rooms in “The Masque of the Red Death,” and seven numbered doors here. Also, the first and last sentences in the text key Poe’s name: “great hall of many doors” contains the letters for Edgar Allan, and, much more clearly, “process of elimination” in the final sentence yields the acronym POE. Asterion, the star at the center of the labyrinth. That really does look like a bull head. It makes sense that if there is another one it would be in the foolish face since the sly face held the first. Or Helios, the grandfather of the Minotaur. I think that the two unmarked doors are likely the doors from Room 39 and Room 42. If we think that the guide and guests entered from one of those doors (rather than from behind where our vantage point is when looking at the drawing) , this could give us a hint as to what direction the Guide is facing when saying that a cat came from his/her right. It is possible that the cat is the one that makes the “thump and sound of footsteps” in Room 15. Here and elsewhere you have correctly struck upon the nature of unmarked doors: They correspond to one-way passages from other rooms, and indeed every such one-way passage has a corresponding unmarked door (saving those to 24, but surely we’d see them if the lights were turned on). In this case, the guide and visitors must have entered from one of the unmarked doors in all instances, since the marked ones are all one-way passages. The picture of pegs being inserted into holes could be indicative of the order in which we take the doors. The round handle of the axe overlaps the 15 doorway, and the round peg is the first object in the picture, while the square head of the axe matches the square peg, the second action, on the poster. I suppose this is meant to specifically clue the order since knowing the axe leads the way, by itself, is not as useful. This is worth mentioning because it’s very subtle. The balls on top of the hands between all the doors look strangely similar to moon cycles, starting with the “moon” on the far left being a waxing crecent, the next one a gibbus, etc. till the full moon at the end two, then waning toward the right wall. I am not sure how this helps but I am looking at patterns, particularly the moon, as a guide clue, since smiles could be vertical crescent moons. What’s this mysterious connection to the number seven? —> There are seven matches in the box. —> There are seven pieces of wood on the floor. —> The hammer’s shadow creates a “7″ shape. —> The ax and log also creates a “7″ shape. —> When the book is held sideways (at a 90 degree angle), the maze on the wall contains two hidden “7″ shapes. —> There are seven doors. Those were seven occurrences of the number 7! Three of the pieces of wood are an H, with the ELL in the map is HELL and that door leads to the trap. Actually, mine was the chair, because they were both in front of two incorrect doors. 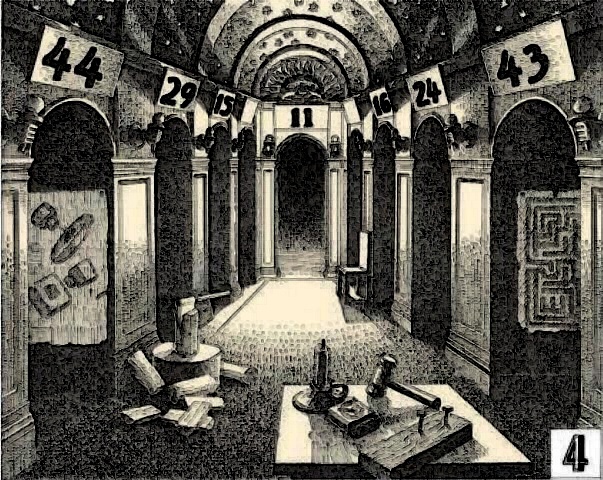 If you check rooms 44, 43, 29, 15, 11, and 16, the only room with candles in it is room 29. Therefore, it is one of the correct doors. Montresotor left room 39 to get a torch from here… he obviously never got them. What happened to him? And the cat was probably chasing all the running mice in MAZE as I once observed. Trying to establish what “Theme”(Games, Astronomy, Mad Scientists, Person, etc.) this room might fall under-suspect ,”Games”. There seems to be so many layers to each room that a Theme may offer a word or concept to direct to ID the Guide and the Rm 45 Riddle Answer. Narrative: “Foolish face” “snorted” = Poker/Porker face. “Haven’t made up their minds” “ process of elimination” = stay or fold (if cards needed are not showing). ELL on the wall = reversed upside-down 7 7 3 = 17, the number a Black Jack/21 dealer has to hit before he can stop taking a hit (hammer/nails). Axe in log = split, card in hole is same as card that is up, player can split the hand. Pegs in slots = slot machines (could the candlestick be a “one armed bandit” (can’t believe I said this). So, are we gambling here maybe in a casino. This room would be one of the “Game Rooms”. What puzzle are you trying to solve in this room Marianne? I wonder whether the M hidden amongst the stars is the takeaway here. I noticed and dismissed it as an incompletely drawn star some time ago, but it is a pretty clear M, and the guide does effectively distract from it by telling us to ignore the face. not seeing M. Which star? Starting from the sun, second ring of stars out, one or two o’clock. Found it. Now I see Ms everywhere, lol. Could be a bit of a “Man-son” hint. Personally – when he said he put his name only once – I think he meant only one Christopher reference. I think this may be 1 of 3 authentic “Manson” references, however. On the other hand – this one does not do anything that I can see. Room 3 does, and room 19 kinda does. Is it just me, or do I see the Big Dipper? Poe’s last story was “The Light-House” (posthumous title) that was left unfinished. In Room #4 everything is left “UNFINISHED”; pegs not in the holes, wood half cut, hammer present but nails not pounded in, matches open but candle not lit=Poe’s UNFINISHED last story. The room is full of LIGHTS and the “beaming” sun=lighthouse beam. Room narrator says, “fortunate that I was still standing”=if he had been sitting it would be in the chair looking across the hall at Door #15 on the left and door #blank on the right. The round/square peg test is part of an IQ test that has standard designation of 15 greater or 15 less. This Poe room “The Light-House” and Door #15 is the correct door. I think you meant “standard deviation” here. And yes the standard deviation on an I.Q. test is supposed to be 15. “Split” belongs in the list of -it words in bullet point three. It’s unclear whether this is what Vewatkin was trying to say in the comment chain below. This room is described as “the great hall” and 43 is described as “a great hall”. They are the only two “halls” in MAZE except for room 1, an “entrance hall” rather than a “great hall”. (16 uses the word “hall” but in reference to here). Here we have the “foolish face” here and in 43 we have the Devil over the door. Also in the door from 4 to 43 we have “ELL”. It’s not hard to put together the two halls and the “ELL” to get hell. But the question then becomes why? Are we to think the devil face in 43 is foolish? Probably. But that’s about as far as I think we can read into it on reasonable footing. It becomes speculative after that. In trying to interpret what that might mean, we can note the fool in 16 seems to indicate the wrong door, and the victim certainly does not steer us right in 39. All three Halls are sephira on the Tree of Life, but that is unlikely to matter. In room 43 the devil really has not been adequately accounted for. The bell is symbolic of faith it seems…hmm…hell’s bell…dunno. The door from here to 44 has the “IQ test?” of putting the parts together. In 44 putting the two parts together is exactly what we have to do to see the fountain. More telling, I think, is that two logs have been split. This seems to go along with the two nails hit and the two pegs to fit and the two lights lit. Correct but already noted in the solution above. I somehow still don’t see it. This room is one of the nodes or sephira on the Tree of Life from mystical and alchemical traditions. In is on the center trunk and rooms here make reference to choices or decisions in some way. Here the reference in more muted in the form of the flipping coins, but there is a connection to room 40 here, also a central node, where they choose at random. Tree of Life rooms tend to feature Trees or living animals, and here we have the black cat. Both here and in 11 the many doors are mentioned, and both rooms are on the center trunk of the tree. This sephira is called Tiferet. In is, not surprisingly, associated with the sun. 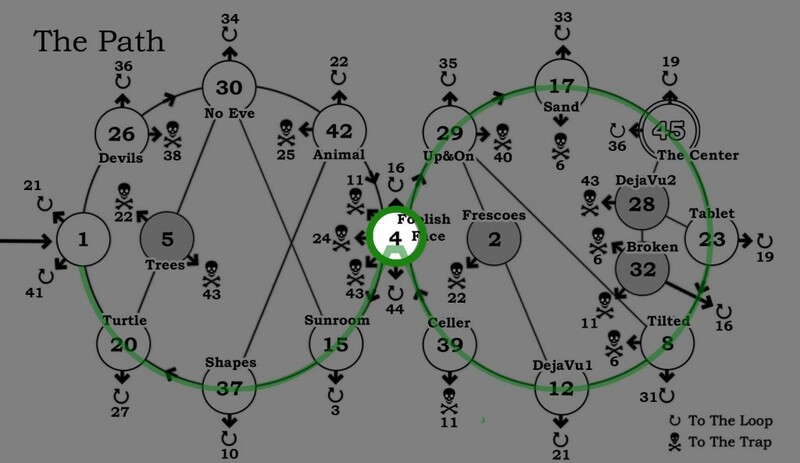 It occupies a central position in the Tree of Life much as the sun occupies a central position in the solar system (and in MAZE room 4 is in the middle of the figure 8). Man, as much as I want to congratulate us all on cracking this room, I just don’t think this is quite right, what we have here. Part of the problem I have is that we’re arguing to give the hammer and ax special status because they have been used, whereas the other -it-verb-suggesting objects have not, so we look at the hammer and then follow where it’s pointing to the ax. But the book of matches and candle line up pretty well as if they’re pointing to the ax as well, and the arrow from the circular peg also points to the ax, so it doesn’t really seem like the hammer is special in this regard. If the chair were pointing at the ax I would just say that everything is pointing at the ax, but while the chair is pointing toward that side of the room (I guess), it isn’t pointing toward the ax. That the ax covers the correct doors must be the important point, but our reason for looking at what the ax covers, rather than looking to where it is pointing–well, the reason seems to be because we know that’s what the right answer is. As for which door is in and which is out, the peg poster solution makes no sense to me, except perhaps as reinforcement for the room having two doors to choose from. And the head/tail distinction, the going-in/sticking-out stuff, is not only weak, but doesn’t fit with the text’s description of using a process of elimination. Well, I don’t know whether that was a warranted assumption, even if it seems to be essentially true. But in any case, here the situation is somewhat different than trying to use an odd-one-in clue that fails to account for a backtracking door. Here, we have a room suggesting that two different rooms have the potential to be [good? ], but only one of the two has the potential to be the next correct step in the sixteen-step path. Moreover, this fits the bill of solving the dilemma by process of elimination; that is, we determine that 29 is the right door only by determining that 15 must be the wrong door. I’ll go along that it is a fair way to reason. I’m fine with the axe and with the hammer and puzzle bit pointing at it, (and with the black cat’s run to 16 to 15). I think this is a “sun man” just like the big guy in 19. They both take us to room 11. Final nail for nail and hammer, I think the 2nd one is a tiny bit more in, and drawing a line from that head through the bottom face of hammer goes to the axe head and therefore the “in” door. The more out nail goes with the out door then. We already knew that Room 39 referenced Room 4 with its hammering and chopping sounds–but in light of the solution we now know, that just confirms that both the ax and the hammer are both being employed in Room 4. Good catch! Adding it to the summary! As Hello Gregor would say, 6/5!